On May 1, 1968 the Detroit Lions and Los Angeles Rams swung a major trade. 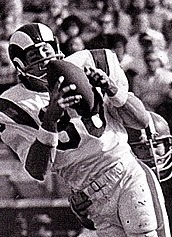 The Rams dealt QB Bill Munson and a third-round draft choice for 1969 to Detroit for QB Milt Plum, flanker Pat Studstill, HB Tom Watkins, and a ’69 first-round draft pick. The 26-year-old Munson (pictured above) had played collegiately at Utah State, where he was only converted to quarterback as a senior. He was chosen by Los Angeles in the first round of the 1964 NFL draft and, while having an unorthodox passing style and not a lot of experience at the position, Munson started 18 games in his first two seasons and pushed Roman Gabriel, the top pick in 1962, for playing time. A knee injury knocked him out of action in 1965 and Head Coach George Allen committed to Gabriel in 1966 and ’67. Munson played out his option and was on the verge of becoming a free agent. As part of the trade, he received a long-term deal from the Lions plus an assurance that he would start. The Lions were in rebuilding mode, having gone 4-7-2 in Schmidt’s first season as head coach. All told, the team gained just 1826 passing yards. Milt Plum, who split time with Karl Sweetan, was on the downside in his eleventh NFL season and sixth with the Lions and had thrown just 172 passes in 1967, for 925 yards and four touchdowns while giving up eight interceptions. No longer a viable starting quarterback in Detroit, for the Rams he fit into Coach Allen’s plan for an experienced backup who would fit well in a conservative offense. Similarly, the other veteran players the Lions gave up were not suited to a rebuilding project. 29-year-old Pat Studstill was valued for his punting as well as pass receiving, and had been a Pro Bowl selection in 1966 after catching 67 passes for 1266 yards. But injuries had reduced his production to 10 catches in ’67. Tom Watkins, 30, was used primarily to return kicks, although he gained 361 rushing yards in 1967. He had led the NFL in kick returning with a 34.4-yard average in ’65, but was on the downside of his career and the Lions had promising new blood at running back. Munson performed well in an offense that had many new starters for 1968, including rookie WR Earl McCullouch and TE Charlie Sanders, although the arrival of another rookie, QB Greg Landry out of Massachusetts, provided a competitor. Munson ranked seventh in the NFL passing statistics while throwing for 2311 yards and 15 touchdowns and giving up just eight interceptions. After getting off to a 3-2-1 start, the Lions lost four straight games before tying the Saints and ended up at 4-8-2. Detroit improved to 9-4-1 in 1969, but Munson broke his throwing hand and missed half of the season. Landry showed off his potential and the two quarterbacks split the starting job in ’70. While both were good at throwing the ball, the 6’2”, 210-pound Munson was a classic pocket passer who was low key and injury prone while Landry was far more mobile and a more effective leader. Collectively, the two performed well, even if they didn’t go to the air often, hitting on 56.8 percent of their passes and tossing 19 touchdowns as the Lions went 10-4 and reached the playoffs. 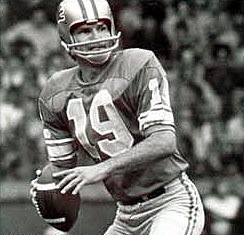 But Landry emerged as the full-time starter in 1971 and Munson tossed just 73 passes over the next two seasons. He returned to the lineup in 1973 when Landry was injured for half the year and led the club to four wins in a 6-7-1 season. Gaining the favor of new Head Coach Rick Forzano, Munson started for most of ’74 and did well enough, completing 56.8 percent of his passes for 1874 yards and eight TDs while giving up seven interceptions. He lasted just five games in 1975, with both he and Landry going down with season-ending knee injuries in the same game, and in ’76 Munson moved on to the expansion Seattle Seahawks, finishing out the remainder of his long career as a journeyman backup. Overall with the Lions, Munson completed 716 of 1314 passes (54.5 percent) for 8461 yards and 56 touchdowns while giving up 42 interceptions. The team went 24-21-3 in his starts. As for the players the Rams received for Munson, Milt Plum saw scant action for the Rams, throwing just 12 passes all season behind the Pro Bowler Gabriel. Tom Watkins saw no action at all, being waived before the season and finishing his career with one game for Pittsburgh. Pat Studstill had just seven catches but handled the punting and averaged 39.6 yards on 81 kicks. His punting kept him with the club for four years. More useful was RB Larry Smith (pictured at right), who the Rams chose with the eighth overall choice in the first round of the 1969 NFL draft out of Florida. The 6’3”, 220-pound halfback led the team in rushing as a rookie with 599 yards and also caught 46 passes for another 300 yards. His performance dropped off thereafter due to chronic injuries, but he lasted for five seasons in LA before moving on to Washington. The Lions sent the third round draft pick they received from the Rams on to the Cardinals four months later in a deal for WR Billy Gambrell. Gambrell, a five-year pro who was a backup for the Cards, caught 28 passes for 492 yards (17.6 avg.) and seven touchdowns in his only year with Detroit.